Soft-bodied... can see finger marks from human handling on many new specimens. Graceful, but do swim into hard objects. 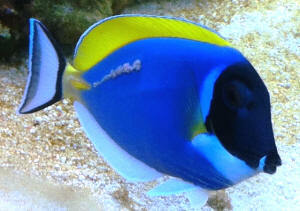 I have a problem with a Powder Blue Tang (A. leucosternon). 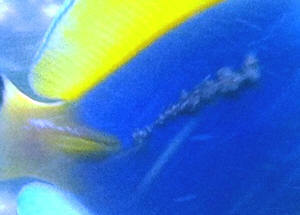 When the fish arrived it had what appeared to be a scratch along part of its lateral line (see image #1). I did not pay it much thought since such minor injuries heal pretty quick in most fish. That was on the 8th. A few days after that the wound got larger and looked "fleshy" with whitish protrusions. I thought that this might have been due to an overeager cleaning shrimp and that it would heal. But the injury/growth/parasite infection keeps getting worse with the current state shown in images #2 and #3. I hope you can see that it has spread enormously along the lateral line, even up to the posterior end of the scalpel. My phone's camera isn't that good and the fish kept swimming away… But in person the look of the growth is fleshy and pinkish (not "fuzzy" as it might seem on the pictures) with small longish white protrusions among it. Could this be a simple reaction/inflammation due to the sensitivity of the lateral line organ or is this something parasitic? 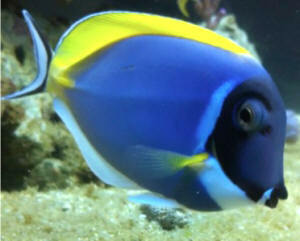 No other fish shows any symptoms (yet). The PBT does not show any discomfort at all, I strangely haven't seen it flashing even once, and it is very active and curious (i.e. normal Acanthurid behavior). It is housed in a 400g reef tank with zero measurable phosphates/nitrogen compounds, 34-35ppt salinity, 78°F temperature, Ca, Mg, alkalinity, pH all in the optimal range, so I think environmental conditions are not the main culprit. Do you have an idea what this might be and what can be done/if it will heal itself? Thank you for your reply, Bob!